In this topic, you will learn about the use and configuration of the Advanced embed code. This version of the player implementation is also referred to as the In-Page or embed_in_page embed code. The Advanced (in-page) embed code permits you to have the player exist in the HTML page directly, not in an iframe. This offers the benefits of ease of accessing the player and associated properties and events. By using the non-iframe player, you lose the ease of use of the player as a single, contained unit in social media applications and sharing. See the Choosing the Correct Embed Code document for further information. Note: If you are a Brightcove Player customer, you will not use the data-video-id attribute to assign a video to your player. You would either assign the video in the Players module or using curl. 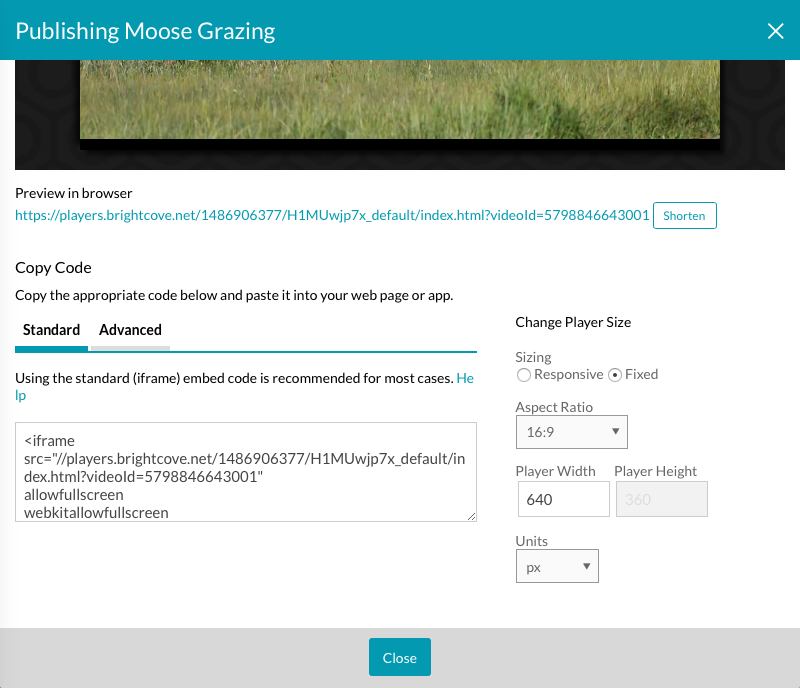 When publishing videos using the Media module, you can use the player URL to preview the video or copy the iframe or In-Page embed code to paste into your web page or application. Note: Click the Shorten button next to the preview URL to generate a shortened preview URL. The Standard link displays the iframe embed code and the Advanced link displays the In-Page embed code. From the Player Management API perspective, you will also see the Advanced player code referred to as the embed_in_page implementation. Note: For information on working with responsive players, see the Responsive Sizing for the Brightcove Player developer document. If you are using Brightcove Player version 6.11+, you change the video tag to <video-js ...> and you will NOT see the icon. It is considered a best practice to use the iframe implementation unless some application logic requires the use of the In-Page code. Numerous attributes are available for the <video> tag to provide additional information about how a player should behave. The table below details available attributes. When using tag attributes that can only be true or false (data type Boolean), you simply include the attribute (no equals sign) to turn it on. In order to use Booleans, the attribute should be disabled by default in the player configuration settings, then it is enabled by including the attribute in the in-page embed code. For instance, if autoplay is enabled in the player configuration there is no way to disable that feature in the in-page embed code. This means that if you want to control a Boolean attribute, you want to be sure it is disabled in the player configuration then you can optionally enable it by placing the appropriate attribute in the in-page embed code. Enabling the attribute in the player configuration overrides omitting the attribute in the in-page embed code. Note: currently the value for preload set in the Studio Player Settings will always override the value set in the video tag attributes, so you must set this in Studio. Note: The preload settings are actually just suggestions in the HTML5 spec and as a result there can be different behavior on different browsers. Setting the value to Yes could potentially have significant impact on bandwidth consumption. The preload attribute informs the browser whether or not the video data should begin downloading as soon as the video tag is loaded. The options are auto, metadata, and none. For HLS playback technology the settings mean slightly different things and noted below. For the HLS playback technology, none means the player will only download the m3u8 manifest so that the video duration can be calculated.